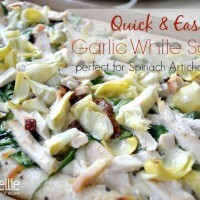 Garlic White Pizza Sauce -- the easiest, and the best! 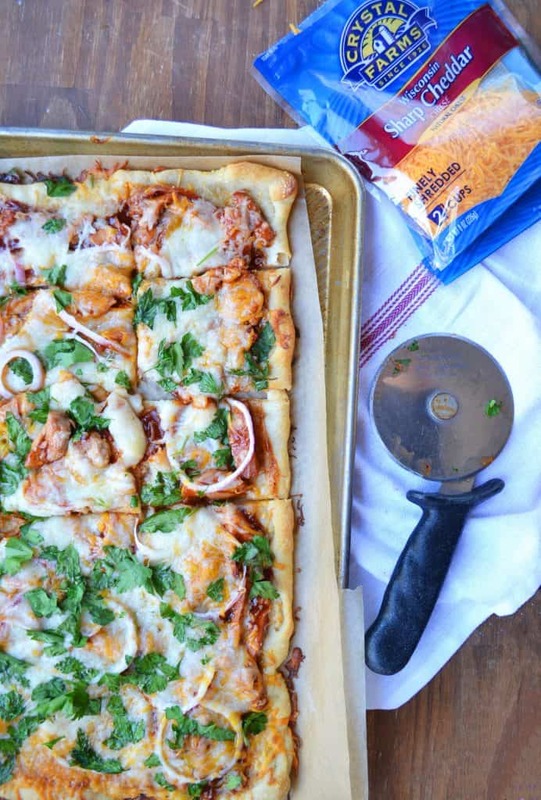 You are here: Home / Recipes / Garlic White Pizza Sauce. 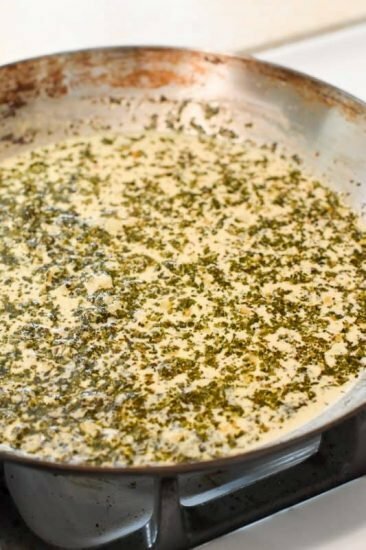 a versatile garlic white sauce that works great on pizza, pasta, and other tasty recipes! Do you love Papa Murphy’s Delite pizzas? 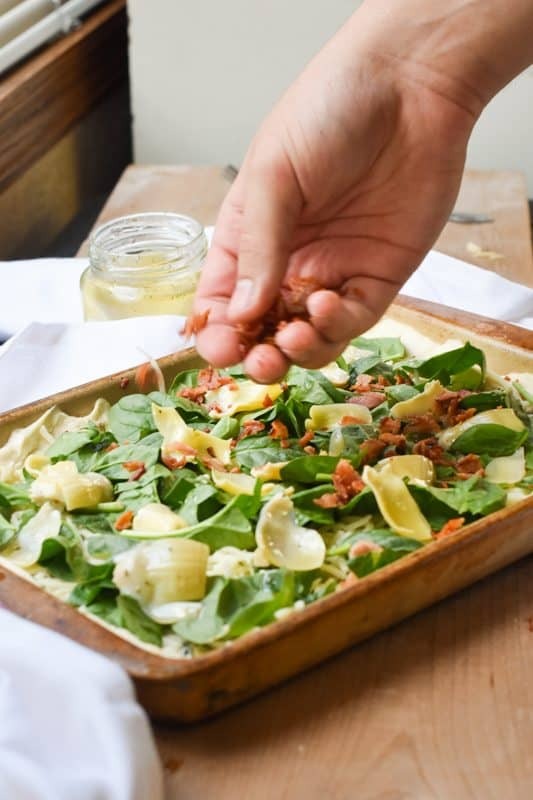 Or just like light pizzas with tons of veggies? Well, this pizza is perfect for you. 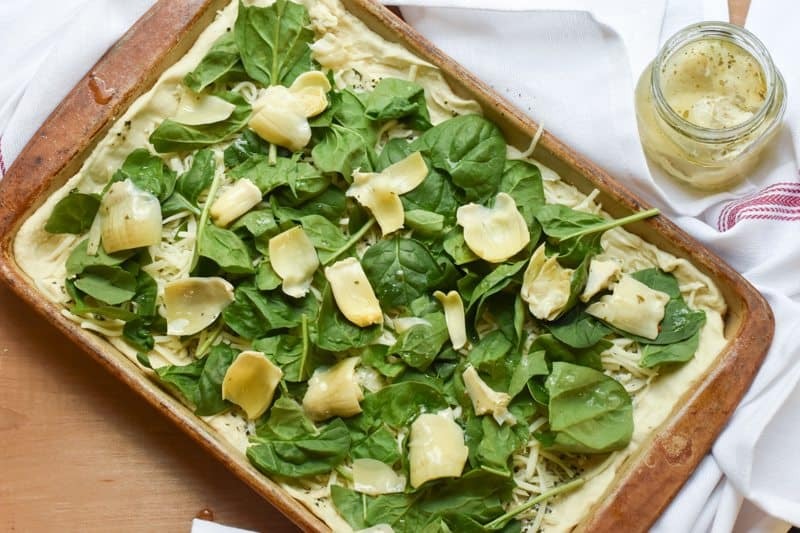 It has a delicious garlic white pizza sauce that allows you to put tons of veggies on it, from artichokes to spinach. 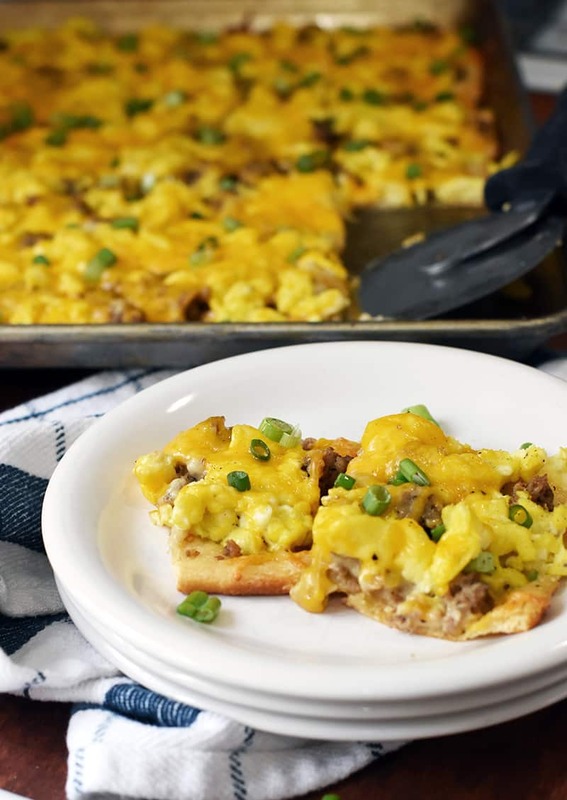 It tastes delicious with all meats, particularly chicken and bacon. It’s perfect if you want a change from the normal red sauce, high cheese, high-fat content pizza that you normally get. White pizza can be hard to perfect. It has a tendency to become gooey and floppy, which are words that should never describe pizza. This pizza won’t do that. The most important part of making a good gourmet pizza is finding the right sauce. And this is the right sauce! (full recipe for the sauce at the end of the post). Start off by heating olive oil and garlic in a frying pan. Then you’re going to add a bit of milk to the mix. Then dump a bunch of spices in so that it is delicious. 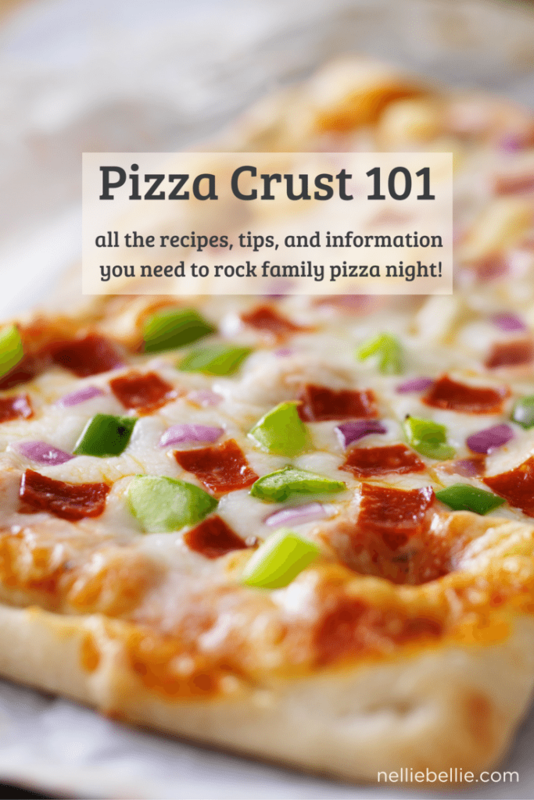 After you finish mixing the sauce, you simply added it to a pizza crust and then put on your normal pizza toppings. The type of pizza crust doesn’t matter. If you’re the type that buys pre-made dough, go for it! It’s easy, and everyone needs ease in their lives. Otherwise, the crust that you just add water to will work, or you can make your own! Then, add your favorite toppings. 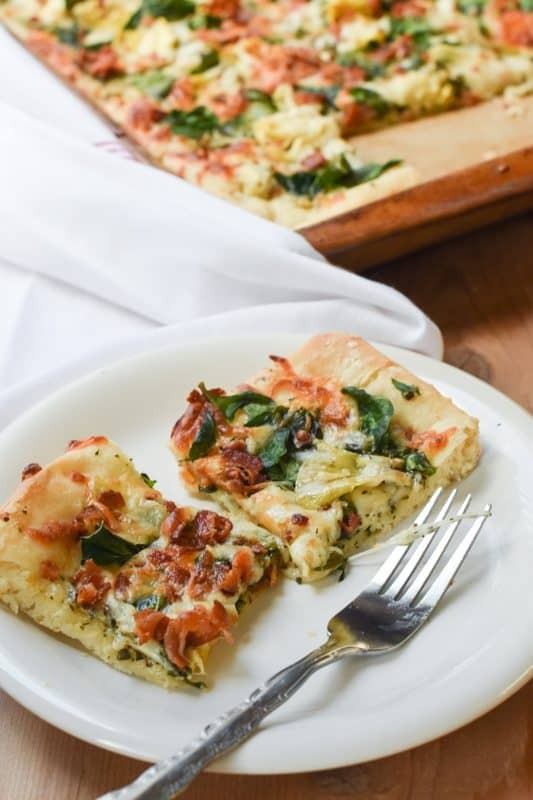 For this pizza, we added mozzarella cheese, spinach, artichoke, and bacon. Cook your pizza according to the directions on the crust. Hello, glorious pizza! No need to go anywhere or get something delivered. Not when you can make something that looks this good with so little effort. Note: amp up this sauce with a cup of Parmesan cheese at the very end. In a skillet on medium-high heat, heat oil. Add the garlic and heat for about 3 minutes, until fragrant. Add the flour (start with 2 tablespoons), oregano, pepper, and salt. Whisk well. If you want the sauce a bit thicker, mix your remaining 1 tablespoon of flour with a bit of milk until you have a mashed potato consistency. Pour that mixture into the bubbling sauce and whisk constantly. Cook about 1 minute more. It should thicken the sauce. Repeat until you have it the thickness you want. OK, I love pizza, love garlic, and love my alfredo sauce, which is similar. So I will be a sport and make your sauce and devour a pizza just for you. Pinned.